Combine the cake mix, oil, eggs and 1 cup of water in a mixing bowl. Stir until well blended. Place liners in a muffin pan. Using a 1/4 cup scoop, fill liners 1/2 full. Roll the maraschino cherries in flour. 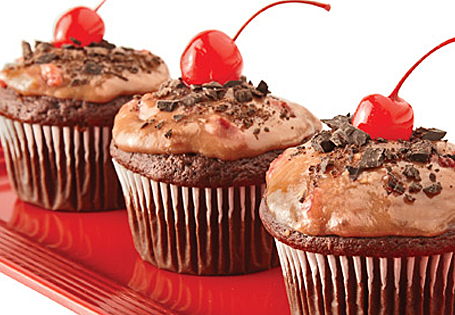 Place one cherry in the center of each cupcake. Bake for 20-25 minutes or until a toothpick inserted in the center comes out clean. Cool on a wire rack. In a small saucepan, bring cordial cherries, powdered sugar, cream cheese, butter and whipping cream to a simmer. Mash the cherries and stir until melted. Simmer for 10 minutes, strain frosting into a bowl. Cool for 30 minutes, frost cupcakes. Grate chocolate bar to create shavings, then sprinkle frosted cupcakes with chocolate shavings. If desired, garnish with a maraschino cherry.